62 gorgeous glossy, creamy colors made for the hand method! Any of our pigments may be used with a machine, mixed together to create a custom shade, or used alone for steadfast natural results! 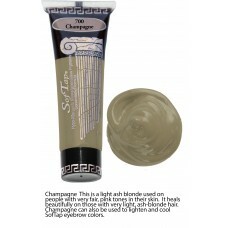 Champagne This is a light ash blonde used on people with very fair, pink tones in their skin. ..
Mink: This color is great for medium ash blondes with pink tones in their skin, and can also be used..
Pecan Pie: This tasty treat is designed for medium ash brunettes or brunettes with blonde highlights..
Brown Sugar: A lovely brown for light ash brunettes who don't like a lot of red tones. Brown Sugar c..
Chocolate Eclair: A beautiful cool brown brow color or a cool liner for dark brown eyes, honey brown.. Platinum Blonde: Lightest of the neutral colors, Platinum Blonde has just enough golden warmth to be.. Bashful Blonde: Great for light blondes preferring golden tones in the eyebrow area, and one of our ..
Amber: A warm, sunny color for blondes who like gold in their brows. Amber is the balance between Ba..
Hazelnut: This color is perfect for blondes who prefer a bit of gold tones in their brows- or for re..
Fawn: This pigment is best for ash blondes or blondes mixed with gray. Fawn tends to heal cooler to ..
Cappuccino: This beautiful color is very versatile - wonderful for ash blondes or brunettes, and dar..
Cafe Vienna: Very popular for medium and dark brunettes who have some hair in their brows and just w..
Espresso : A fantastic color for people with less than 50% grey in their hair. Espresso is very nice..
Earth : Earth is a neutral brown that contains all of the warm and cool hues of nature. Great for wo..
Mahogany: Dark, rich, and lively, Mahogany is the perfect neutral for Asian and Hispanic skin types ..
Charcoal : A cool liner that heals as a soft black on women with warm skin tones. Charcoal is great ..
Caramel : Great for strawberry blondes or blondes who like a little more red in their brows. Caramel.. 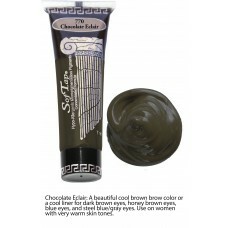 Milk Chocolate : Perfect for light brown hair and light warm brows. Also great for light skinned Afr..
Bordeaux : A nice warm color for medium to dark haired people who desired a brow that is not too dar..
Copper : Great color for redheads! Also lovely on African American people with medium toned skin and..
Cocoa: We love Cocoa on auburns, medium to dark brunettes, and African Americans who want medium bro..
Chocolate Truffle: A beautiful warm brown for dark brunettes who don't want their brows too dark. 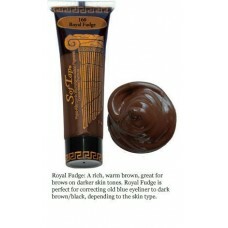 Th..
Royal Fudge: A rich, warm brown, great for brows on darker skin tones, Royal Fudge is perfect for co..
German Chocolate: This delicious warm brown is great for brows or hair strokes on all skin types, es..
Cafe Ole: This is our darkest warm color for brows and/or eyes. It looks fantastic on people with bl..
Valentine: Valentine is the reddest of our reds and heals as a medium to bright pink depending on th..
Tickle Me Pink: This happy color is great as a medium pink tone for lips. Tickle Me Pink is also oft..
Peaches 'N Cream: Our most orange toned lip color. Very nice on pale lips with rosy tones in the fac..
Mango Obsession: Great for warmer and paler complexions, Mango Obsession is often used on clients wi..
Blushed Petals: This color heals to a beautiful pink/orange. If the lips are cool, you will have mor.. Innocence: One of our most popular colors, Innocence is part of the Imposter Collection, guaranteed ..
Sweet 16: This youthful bloom is perfect for those who want just a little boost of pink in their lip..
Victorian Rose: Sweet and classy, Victorian Rose is a natural looking red/pink and part and part of .. Pastel Rose : This is our lightest brown/pink. It may appear to be orange at first, but don't let th..
Secret Passion: A beautiful earthy color without too much pink, Secret Passion heals up a little bro..
Jamaican Rum: One of our most popular colors, Jamaican Rum is part of the Imposter Collection, a set..
Havana Girl: Part of the Imposter Collection, Havana Girl is the brownest of the brown/pinks and loo..
Cupid's Kiss: Cupid's Kiss has the most mauve of the mauve/pinks and heals to an earthy pink. If the..
Irish Moss: This is a brown-based eyeliner with some green tones. Great as a medium liner for women ..
Jade Granite: A gray-green color that can be used with a variety of eye colors. Jade Granite l..
Blue Lagoon : When you see this color, you will probably think its black - it is not. Blue Lagoon is..
For cooling off any color! This is a mixer color with strong green undertones for canceling red. Do ..
Orange Aid: This color is best for neutralizing blue or gray eyebrows. You can also add it to any li..
Lime Aid: This is the best for correcting reddish or orange eyebrows. If the red is very dark, try m.. Lemon Aid: This is best for correcting purple, pink, blue, or dark gray eyebrows. Great for the clie..
Black Orchid: Our most popular eyeliner color, this is a beautiful true black for those who wear the.. Tempting Teal: This fun hue is for women who have gorgeous green or brown eyes and want everyone to ..
Sandy Beach: Slightly darker than Pearl and a little warmer, Sandy Beach is meant for those transluc..
Seashell: Like the inside of a Seashell, this color is pink and bright, for clients who have rosy to..
Salmon: This color is more orange then the other flesh tones. It is also used for lightening mauve/p..
Golden Sunrise:This color is meant for olive skin tones, Asian, Hispanic, or Mediterranean skin. Gol..
Tahitian Tan: For darker skin tones, Tahitian Tan blends well with ruddy skin types. If the skin is ..
Cotton Candy: This is a sweet, light pink color for areola re-pigmentation. Results are fresh, youth..
Pinkaboo: Peek-a-boo! This light pastel pink is a very popular shade for areola re-pigmentation. Pin..
Princess: Naturally classy, subtle, and always there for her subjects, Princess is a beautiful and s..
Sinnamon: Spicy and sweet, hot and sugary, Sinnamon has all the warmth and depth of color as real ci..
Mocha Java: This color has a real mocha base to it. It can be lightened with Tahitian Tan and deepen..
Cherries Jubilee: Delicious and refreshing, Cherries Jubilee is a rich, medium/mauve pink for areola..
Earl Grey: This is the lightest brow color in the cool palette. Although this is called Earl G..
An exfoliating product for lightening small spots of unwanted pigment. 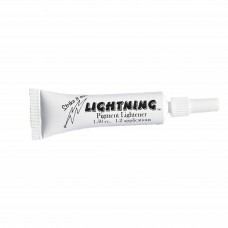 Lightning comes as a very thi..